Rockstar Energy Husqvarna Factory Racing will have no fewer than eight riders competing at the 2017 FIM Motocross of Nations, which takes place at Matterley Basin, Great Britain this coming weekend. 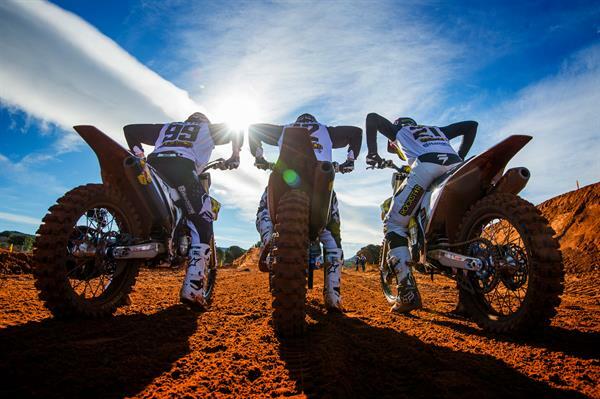 Gautier Paulin and Christophe Charlier will race for Team France, Zach Osborne and Thomas Covington will represent Team USA while Max Anstie with Dean Wilson will form an important pairing for Team Great Britain. Further strengthening the Rockstar Energy Husqvarna Factory Racing team’s presence will be Thomas Kjer-Olsen and Max Nagl, who represent Denmark and Germany respectively. Held at the iconic Matterley Basin track in the south of England on September 30 and October 1, the 2017 edition of the prestigious event will host riders from 29 different nations. The most highly anticipated event in the annual motocross calendar, the MXoN will see Husqvarna mounted riders battle for victory in all three major classes MXGP, MX2 and Open. Leading Team France’s efforts in the MXGP class will be Gautier Paulin. Following a stellar season in which the Frenchman secured third in the 2017 MXGP World Championship standings, Gautier will be looking to defend Team France’s MXoN title. Set to compete for Team France alongside Paulin will be Christophe Charlier, with the Frenchman racing his FC 250 machine in the MX2 class. Charlier will be returning to motocross competition after a strong first year competing in the EnduroGP World Championship. Enjoying a hugely successful season in the US, that saw him claim both the 250SX East Region Championship and the 250MX Championship, Zach Osborne will lead Team USA’s efforts at the MXoN, competing in the MX2 class. Looking to continue his strong run of form aboard his FC 250 machine, Zach is focused on challenging for the MX2 class victory. Set to race for Team USA alongside Osborne will be Thomas Covington. Wrapping up a solid Motocross World Championship season by securing the MX2 class victory at the season finale in France, Covington will be making a switch to the FC 450 machine and the Open class for the 2017 MXoN. Following an impressive second half of the Motocross World Championship Max Anstie is looking forward to the 2017 MXoN on his home soil. Remaining aboard his FC 450 machine, Anstie will be Team Great Britain’s representative in the MXGP class. Racing on European soil for the first time this season will be US Supercross and Motocross racer Dean Wilson. Representing Team Great Britain alongside Anstie, Dean Wilson will contest the Open class aboard his FC 450 machine. Rockstar Energy Husqvarna Factory Racing’s rookie sensation Thomas Kjer-Olsen will race for Team Denmark at the 2017 MXoN. Securing a strong third in the MX2 class of the 2017 FIM Motocross World Championship, the young Dane will be a strong contender for victory in the MX2 class of the MXoN. Highly-experienced Max Nagl will race in the MXGP category for Germany, with the event offering the perfect opportunity for the German to wrap up his season on a high note in the United Kingdom. Enjoying a very strong presence at this year’s Motocross of Nations, Husqvarna Motorcycles will have a total of 16 riders entered into the 2017 edition of the prestigious event in the United Kingdom.